11/09 Bring beads and/or jewelry to the November meeting for the show and tell, and share your techniques and ideas! Also bring a bead made on a 3/32" - 1/8" mandrel for the leather jewelry project!! 11/07 Loren Stump will be at Flametree Glass (https://www.flametreeglass.com/) and will give a murrini free demo on Wednesday, November 29 from 6-8 pm. Photos for the Southern Flames 2018 Postcard will be taken at the December meeting / Holiday Party. Remember to bring a bead!! (Or send a clear photo on a light gray background). Also, bring an appetizer or desert to be entered into the Appetizer/Desert challenge! 10/15 Southern Flames is participating in a bead-of the month Beads of Courage program, receiving a new bead each month. Starting at the October meeting, attending members will be given a chance at the drawing, and those bringing a BOC donation will be given an additional chance at that month's bead! 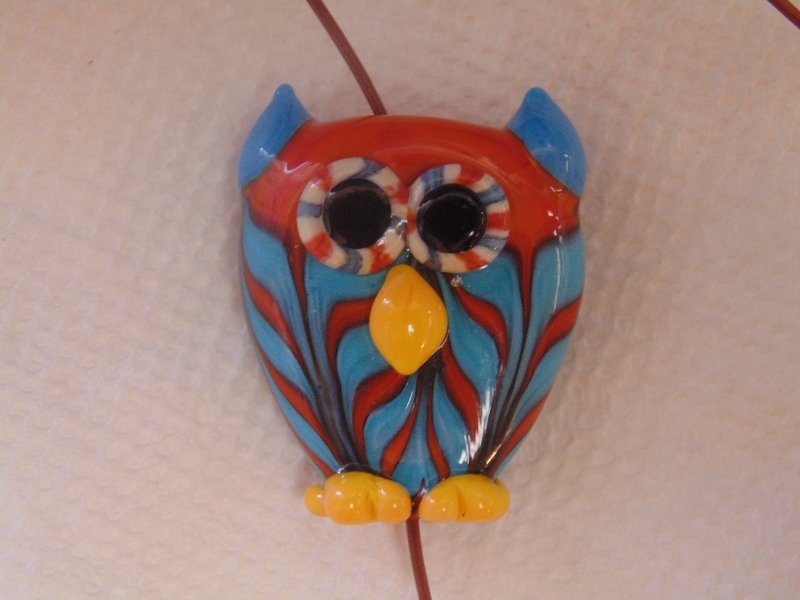 04/05 The Beads of C ourage January "Owl Bead" (isn't he cute??) will be raffled at the April 22 meeting, with tickets selling for $1 each. Buy 5 or 25. Tickets will be going fast, and all proceeds will be donated to BOC! 03/05 C3 Studios in Duluth is closing, and liquidating all glass (Bullseye), kilns and other supplies. Check their website for more info: http://www.c3studiosinc.com/.